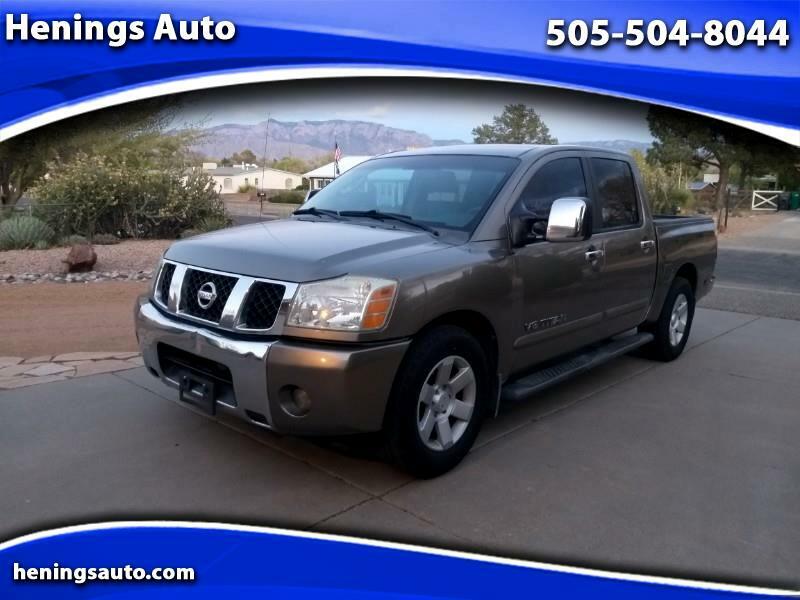 2006 Nissan Titan LE Crew Cab in excellent working condition with only 144k miles. Strong 5.6L v8 engine and smooth shifting transmission. Leather seats. Passenger and driver seats power adjustable. We also accept Debit/Credit Cards. Call us at 505-504-8044 today to schedule your test drive. The information, products, and services published on this website may include inaccuracies or typographical errors. This dealership and/or its respective suppliers make no representations about the suitability of the information, products, and services contained on this website for any purpose. All such information is provided "AS-IS" without warranty of any kind. Our dealership and/or its respective suppliers hereby disclaim all warranties and conditions with regard to this information, including all implied warranties and conditions of merchantability, fitness for a particular purpose, title and non-infringement. In no event shall our dealership and/or its suppliers be liable for any direct, indirect, punitive, incidental, special or consequential damages arising out of, or in anyway connected with the use of this website, or with any delay, or inability to use this website, or for any information obtained through this website, or otherwise arising out of the use of this website, whether based on contract, tort, strict liability or otherwise, even if the dealership, or any of its suppliers has been advised of the possibility of damages. Because some state's jurisdictions do not allow the exclusion, or limitation of liability for consequential or incidental damages. The above limitations may not apply to you. Please expect a certain amount of wear, use, and flaws, as is standard on all used cars. All used cars, including this one may have dings, nicks, chips, scratches and other marks that are associated with use consistent with age and mileage of the vehicle. Obviously, a car that is 10 years old will show more wear and have more flaws than one that is 2 years old. Since these vehicles are used, please remember that books, extra keys, remote entry keys, CD cartridges, etc..., do not always remain with vehicles throughout their life and we are not responsible for providing them unless otherwise represented or photographed by us.